In a large bowl toss the diced apples with lemon juice to keep them from turning brown. and add the onions and celery. Drain and rinse the lentils (if you don't like lentils, Linda substituted chick peas*) and add to the bowl. Add the dressing and toss until well mixed. Let stand at least one hour. We found this hour was essential to bring the flavours together. An excelled vegetarian option when served with bread, rice or potatoes. I made some minor modifications from Linda's original submission - I hope you don't mind. 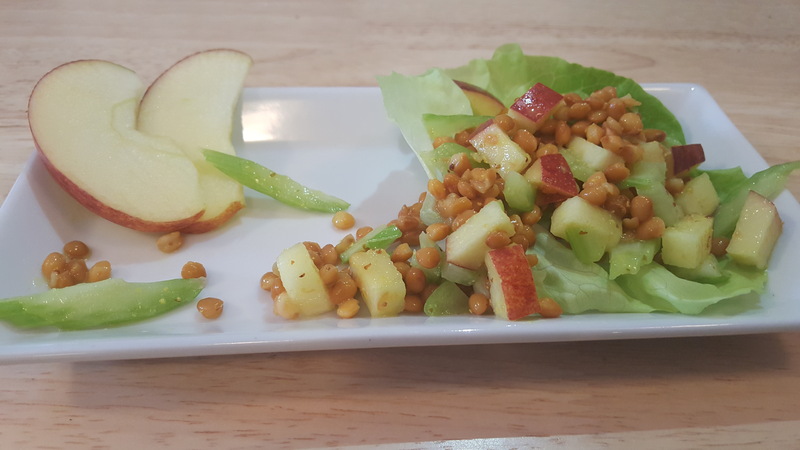 I found with lentils the fruit & veggies needed to be finely diced, but with chick peas, you may prefer finely sliced apples and celery as Linda originally made it. Thanks Linda for providing us with this fabulous recipe.